Friday saw Auckland’s entire rail network melt down following a major signal fault at Britomart and causing massive disruption. Mayor Phil Goff later confirmed the fault impacted both primary and back-up systems. Signal system failure. Both and primary and back up. The third back kicked in but it had reduced capacity. While we don’t yet know what caused the signals and their back-ups to fail, it is something that simply should not happen. Serious questions need to be asked of Kiwirail as what went wrong and what is going to be done to prevent it from happening again. It also brought back memories of a power failure in the control room in Wellington in 2012 that had a similar impact and a 2013 outage that also took out primary and secondary systems. What’s the point of having back-up systems if the back-ups fail anyway? I don’t want to spend too much time on the cause of the fault, nor the communication from Auckland Transport, we’ve written countless posts on that subject. Instead, I thought I’d share my experience which I think highlighted some of the big weaknesses and opportunities for making our public transport system work for more people. With no trains, I needed to find another way to get to work. For those that have read about my commute before, I recently moved offices and so now need to travel the Smales Farm busway station. My usual commute usually involves catching the train from the Sturges Rd Station to town where I transfer to a NX1 service. I didn’t find out about the issues till I arrived at the station at which time I had to think though my options. I quickly discounted the option of going and getting my car and driving as parking options are limited. I couldn’t consider riding my bike to work as my bike was already at work. 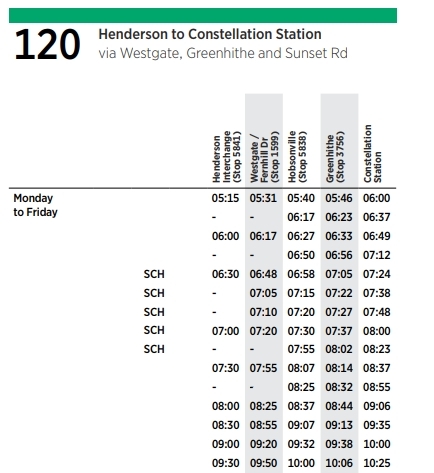 So next I thought about bus options and that perhaps I should try the 120 bus that goes from Henderson to Constellation where I could transfer to a busway service. This is shown below. I hadn’t tried an Upper Harbour bus since well before the rollout of the new network with the old 130 service which at the time was a contender for one of our worst bus routes. The new network had fixed some of the big issues with the route, making it a bit more direct but there are three key reasons why I hadn’t tried it before now. A route over the upper harbour has long been on maps as a future rapid transit route but even following the new network, AT have continued to treat it as an afterthought and it only runs at 30 minute intervals. As Jarrett Walker says, frequency is freedom and this service isn’t anywhere near frequent enough to use reliably. The service does happen to run past the Sturges Rd station and upon checking AT’s app I found I was in luck with a bus due in just five minutes. Had I been running late and arrived for the following train I would have been out of luck on this. The bus arrived but was fairly empty, having about 5 other people on board (most are behind me). The first major issue with the service quickly reminded me of why I hadn’t given it a go before. It is slow with the timetable suggesting it will take over an hour to travel about 25km. On a completely empty road the driver was crawling along which I assumed to be because he didn’t want to get too far ahead of the timetable. We did however start picking up a handful of passengers along the way until we reached Westgate, where despite the driver having been driving as slow as he possibly could, we still arrived ahead of time. The driver promptly turned the bus off leaving us to sit and wait. Some of you link users will know what this is like and it’s immensely frustrating from a passenger point of view. About 5 minutes later we got underway again on our journey down towards Hobsonville Point. Again it was a slow crawl and upon reaching the outskirts of Hobsonville Point we took another break for a few minutes. By this point there were about 15 passengers on the bus (a couple had hopped off along the way too. After getting underway again we got to enjoy a brief burst of speed as we crossed the harbour on the motorway before diverting back through Greenhithe. The Greenhithe diversion is one of those trade-offs that planners have had to make, sacrificing directness for usage – annoying for those longer distance passengers like myself but great if you live in the area and want to catch a bus. About half a dozen did so the bus filled up a little more. The timetabling on this route clearly needs some work and is one of the reasons I had dismissed using it after the new network. Fixing the timetable is an easy win that could shave 10-20 minutes the journey. It begs the question of why it hasn’t happened yet. The third and final reason I have avoided this service is Upper Harbour Dr. I use the road when I ride to work and for some of the year it isn’t too busy but particularly around February to April it gets completely jammed as a result of congestion on Albany Highway which the road connects to. Sometimes cars can be queued over 3km back from the intersection and the thought of being stuck in that sends shivers down my spine. Again luck was on my side and the road was clear, as was Albany Highway, perhaps some people had taken an extra long weekend. Thanks to this we arrived at Constellation Busway Station 5-10 minutes early at which point all 20+ passengers disembarked and walked straight across to catch busway services. Further proof that people will transfer. After a short trip down the busway I had reached Smales, probably a few minutes earlier than I would have had the train been working normally. This also had the added advantage of not passing through the city centre fare zone so only counted as a 3-zone fare instead of a 4-zone for my usual commute. I couldn’t help but think how much more useful the service would be if AT could get the timetable right and do so reliably. A journey time of 45-50 minutes from Henderson to Constellation is still too long but could be feasible instead of the 1hr 7 minutes the current schedule allows for. For many along the route that would mean a much faster journey and might be enough to make PT viable. I for one would use it regularly as it would be much faster than the train alternative. I also expect that this route is not alone in having these issues. Routes that don’t travel to the city centre seem to be almost forgotten about by AT unless they’re looking for services to cancel to fund more peak buses to the city. Yet these routes have an important role to play and fixing them can help make the network more of, well an actual network. In November 2016 “Paperboy” was launched as a free give away magazine that was everywhere at AT stations. It failed, closing 14 months later. Which only goes to show how obsolete such free publications are now. A great idea thirty years ago, no so much now. 2/ AT could have a Youtube channel with some sort of “AT TV” show? It could carry a live stream Breakfast TV feed from TVNZ or TV3 with breakouts for transport related news for the morning rush hour and maybe simulcast RNZ or something in the evening rush hour. They could run banners with constant updates on delays, alternatives and general information. It wouldn’t be hard, a little studio and the kit required would could well less than 20k and a couple of dedicated presenters/news aggregators who could be re-dedicated from the current PR team. Good ideas, Sanctuary. By the time I got an email from AT saying that the services were stopped (11:36) the messages people were getting via text had already changed to say services were up and running again. Whatever they do, all the channels of communication need to have equally up-to-date information. But since you raise it, it’s not true that everyone has mobile devices, let alone in working order, with data, not ‘confiscated’ for some misdemeanour, and not left behind somewhere by mistake. AT needs to provide for people, not just people plugged in to electronics. I’m interested to know if Matt could have decided what to do at the station if he hadn’t had a smart phone with him. Was there a complete network map on display? Were there timetables on display for at least the buses in the vicinity? That’s the bare minimum I think is required for day-to-day operations; for a situation like this, there could be extra information given. I wonder what budget there is for Wayfinding now? The bus stop signs have got considerably better since the new network rollout. When websites “update for mobile” what this usually means is that my phone can no longer use them. Similarly it just randomly stops working with sites that it always used to access no worries, e.g. this one. I think Journey Planner works but Journey Planner also doesn’t work if you catch my meaning. I wasn’t affected by the signal failure because I wasn’t going anywhere on Friday, but what I imagine would’ve happened based on previous incidents is that I’d have arrived at the train station none the wiser. If it was an early day I might have missed the signal fault or been unlucky enough to catch a train where we’d eventually end up at some station that I don’t use and can’t necessarily figure a way out of by bus using my timetables. I mean, it’s no worries if that station is Otahuhu or Middlemore but I’m not sure what connects at Papatoetoe (other than the 380) and the only map I’ve got which shows Puhinui station shows nothing that goes to the station (and lacks a scale). Further north than Otahuhu but south of Remuera (in a pinch, I’ll walk from Newmarket to uni) would be a problem likewise. I’m not going to carry timetables that are only relevant when the unexpected happens. Even just having on the platforms a map with all the nearby bus routes and some circles indicating distance would be very helpful. The timetable information shouldn’t be necessary because the purpose of these maps is orientation rather than destination. In situations like Friday with people being effectively abandoned at random stations this is helpful and for people intending on transferring but not sure where the bus specifically stops it’s what they need. Maybe fewer fare evasion ads is a small price for this service? Failing that sticking these kinds of maps in the train timetables would make them much more useful. Agreed. I had looked at the 120 when the new network launched and thought I was misreading the journey time or they had been misprinted. It’s far too long for what will be – for 90% of riders – a connecting service. Why would you bother if it’s even going to take you ah hour to get to the place where you can then catch a bus to where you want to go? Still, at least the changes needed should be an easy win for AT. 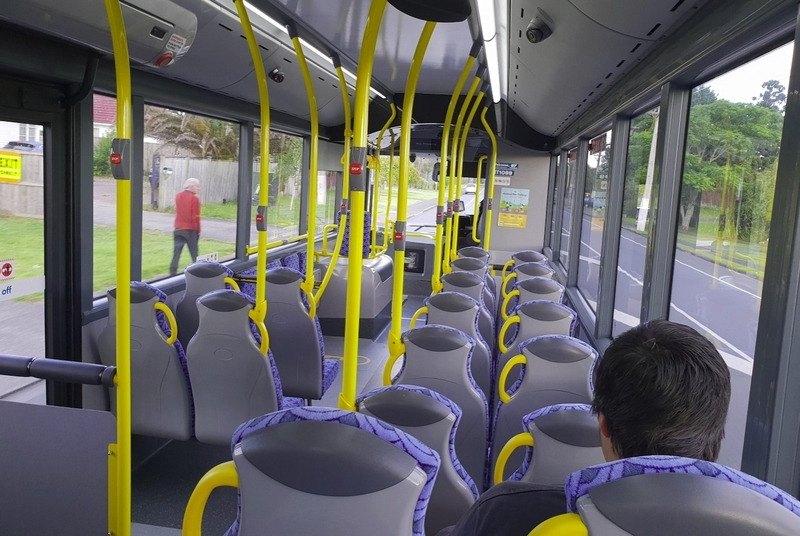 The second part of this post reminds me about catching those 992x/997x services from Hibiscus Coast station into town in January a few years ago. They were timetabled for typical March-November traffic, and passengers would routinely hassle the drivers for waiting 10 minutes at HC station when traffic had been light because half the Whangaparaoa peninsula was still on holiday. In a sense AT can’t really win. If services get ahead of their schedule, people miss them and get irate. If the timetable is too ambitious, services run late and people get irate. Obviously the solution is bus priority where congestion gets heavy, but these things take time, especially on a long route like the 120. Yes, bus priority is indeed the solution. The madness is that some of the new roads being built as part of the supporting growth programme in the west should be bus and active mode corridors only. Instead, they’re putting in general traffic, with no bus priority. So yeah, it takes time, especially if you spend money going backwards. Agree 100% Matt – the old 130 was straightened out a lot and truncated at both ends to make it more useful. Then the timetabling team get their hands on it and look at the run times. On some days it’s congested (yes, this is Auckland – it happens), so they dumb down the timetable so that most of the time it runs “on time”. Result – exactly what you experienced. I’m not sure how this issue is best elevated within AT – it’s not only this service that suffers in this regard, New North Rd and Sandringham Rd services seem to dawdle along so as not to arrive at a stop early most of the time. As well as being frustrating for the customer on board, this approach also uses more vehicles to operate the service, as the overall run time is way longer than it needs to be. Result – more cost, less patronage. Totally nuts – would most folk really care if it ran late on particularly congested days? If you’re in your car, you’re sat in the same traffic, with the same unpredictable travel time. On a related issue, this route has virtually no bus priority over it’s entire length, so cannot readily be insulated from “bad days” on the network – thus the approach to ultra conservative timetabling that is adopted. As a former telecommunications technician with NZ Post Office in the pre-Telecom days, I’ll suggest a likely reason for the signal failures. The rail network was to be shut down for the entire Anniversary weekend, but failed the day before on the Friday. Well in advance of the shutdown, the system is rewired and reconfigured for the new condition at night when there is no traffic. Yes, that’s right, it is put permanently into the new condition. It is then fully tested. It is then put back to its former state in a temporary fashion for going back into service the following morning. The temporary restoration might include patch wiring that is not firmly fixed to supports, plastic wafers that prevent certain relay contacts from making, and certain devices that jam relays in the operated condition. At the time of the changeover, all of the temporary wiring and other bits and pieces are simply pulled away and voila, it’s all new. As to the failure, perhaps an animal disturbed some tacked-on wiring or other temporary device, or perhaps vibration from passing trains caused temporary wiring to fall down. These may have put part of the system into its new condition prematurely. It’s all very well having backup systems, but in general they add to the complexity. The equipment that switches from normal state to backup is itself a source of failure, and the worst thing is that even though redundant virtually all the time, it is always connected and live and subject to failure. Having worked on large Petrochemical Plant with complex control systems I have seen this sort of thing happen many times. Sometimes I used to “think just don’t change anything”. Thank you for bringing this up the real neil. Any changes in configuration carries risk. So people you probably just skimmed through his post with glazed eyes but go back and have another read because it may help realise why complex systems are best avoided. For example wiring up solar panels is actually very very simple compare that to operating a combined cycle gas power plant. A clean green future can be a simple future. If you do that same transfer at Constellation Dr after 5pm you get to watch as 5 or 6 ‘Not in Service’ buses go south while you wait for the in service bus. They have to do that to make sure the bus is crowded, otherwise people might enjoy the ride. I suppose it is a chance for those who were never immunised to gain exposure. IRL opportunities are rare, and valuable, too. Loneliness has a big social cost. I believe the Ministry of Social Development is considering funding a ukulele player for each bus. That’s certainly one way of keeping patronage down. Mrs mfwic’s mother can clear a room with a ukulele in less than 5 minutes. It is something to behold. Miffy – so, buses are like cowpox? There are probably many other services like that. For example 131 (Henderson Station Te Atatu Peninsula). Could be a nice train connector, but at peak it runs only every 30 mins (going to once an hour after 7pm, doesn’t start till 6am) and it also suffers from ‘timing stops’. Lack of bus priority along recently rebuilt Te Atatu Rd doesn’t help with timekeeping either. 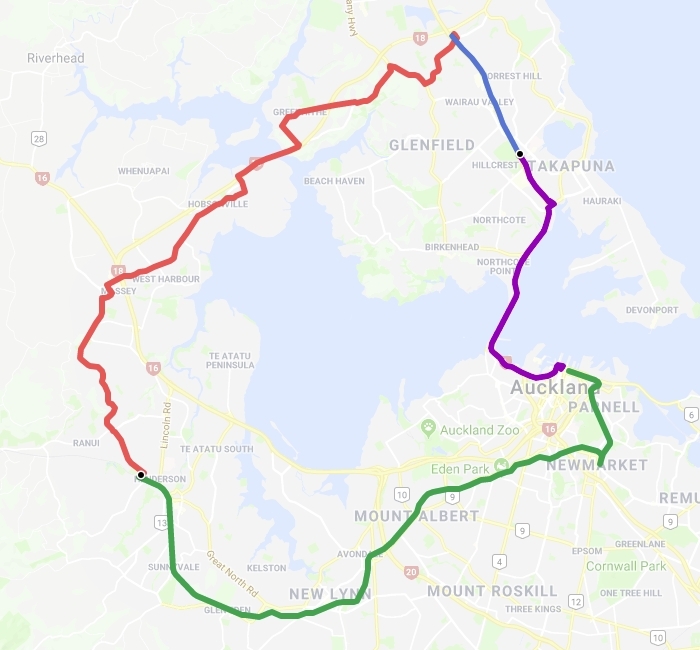 They way it loops around Henderson (and complete lack of any bus priority there) also means it can take 15mins to actually get to Great North Rd from the train station stop. students of Massey College hence better frequency is only between 2pm and 3pm. It almost feels like AT actively trying to reduce any potential patronage so they can kill the route off easier when the next review comes. Some of the NW routes (like 120, 110 or 131) look great on the map, but when you try to use them it turns out they’re either painfully slow or simply unreliable. This issue exists on the frequent 70 as well. In normal traffic heading into town the bus will stop at Panmure for up to 10 mins to keep to timetable, this is despite the service running every eight minutes during peak. If they can’t sort this on a frequent route I hold grave concerns they will solve it on the 120. The perversion of KPIs. The practical measurements should be shorter trip lengths and shorter transfer times. Both are solved by frequent bus services going as fast as possible. But we get bad proxies instead – KPIs that are easy to plan for and in doing so detract from the actual things that people want: shorter trips and low transfer times. I feel like Friday’s issues highlight, once again, a major problem with the entire rail network. If all the trains go through a single point (Britomart), then that is a significant point of failure. As soon as anything goes wrong at Britomart, whether it be a signal fault, a power failure, a train coming off the track or anything else that causes the trains to stop running, suddenly no trains anywhere are running. And that’s not going to change after the CRL. In other news, I catch the 120 to go visit my parents occassionally. I actually quite like it, at only half an hour from Henderson to Hobsonville, but the infrequency of the service can be a bit off putting. I’m told by someone at work who commutes from Greenhithe that it get padded out half way through the route with additional services, so there’s a 120 every 15 minutes during peak if you live in Greenhithe. Friday’s issue was much wider than Britomart. If the problem is only at Britomart it is still possible to run trains on the rest of the network, the actual issue is that a large proportion of users want to access Britomart so the network is a lot less useful with it out of action. Which, incidentally, highlights a big advantage in building a fully separate additional railway instead of trying to stuff ever more services into the existing one. Faults on the existing network and on the new Light Rail one won’t infect each other…. * Timetable waiting is a pain. A peak service Westgate-bound stopped in Greenhithe for a few minutes! * It’s a convenient service from Hobsonville to Westgate mall. There are 3 buses that run this route, but the 120 is the most direct and most frequent. The 112 and 114, which take indirect routes are superfluous for this purpose. Yeah, needing to turn the bus off during a route with passengers still aboard – a pretty big clue! Odds on Auckland Transport getting the hint? That 120 route definitely sounds like it’s padded for March madness & should surely be a frequent route anyway as you say. The only way to have a timetable work for different times of the year apart from having more bus priority is to have a busy and non-busy version or summer and winter version or something like they do with some ferry services. You definitely need a weekday and non-weekday version for some routes. Our local 66 route has recently done this to cope with the Sylvia Park & motorway interchange traffic hold ups. Not off topic. Bus timetables are only padded – as Matt experienced – to allow for the unpredictable nature of general traffic. The PT network needs to be as isolated from that as possible. Buses also need to be faster in comparison with driving than they are, so that people will switch. And it’s important for the whole network that these buslanes are put in. We are wasting rates and taxes on having buses that get stuck in general traffic. we could be spending our money a whole lot more wisely if this money wasn’t being wasted; on better frequencies, on more routes, on better amenities. Which I mention, because your issues out east affects me out west, and vice versa. So we all need to support all these calls for more bus priority. No Heidi. Train timetables are also padded when punctuality is prioritized at the expense of journey-times. This is not just an issue for buses in traffic. Currently there is inadequate incentive to improve journey times for rail also. Step 2: Does it have the expected outcome? → yes: Great! You’re done. → no: Continue to step 3. Step 3: Find a group of people you can refer to as “trolls” and blame them for the ‘strange’ result. Then act as if the poll had the expected outcome. → That is over 20 km. One hour would already be a very good speed for a bus line. Rapid transit line over the upper harbour would be nice, but if you look at the current anchors (Westgate and Constellation station), it is not coming soon. There’s rapid transit, and there’s rapid transit. A fairly simple but effective BRT line could be had with maybe two interchange stations and some tweaks to bus lanes and shoulders. It is still holiday time for a lot of people, school’s still out, so the traffic levels are probably lower than the busy times hence the infuriating waiting at stops. But really, it shows the problems with a PT service that consists of buses running on public roads with virtually no priority. Always a second rate solution used mainly by people with no other choice. The issue of bus schedules being way too long is definitely not an issue that only affects the 120 – it’s an issue for pretty much every service in the North-West (source: I live in the North-West). Auckland Transport does nothing to help themselves in this regard either, with the latest schedule updates they did near the end of last year they actually made my route (114) take LONGER than before (previously it had to wait, drive slow, and arrived early already), and they shifted it later so that the scheduled arrival time at Westgate is 1 minute (yes, ONE MINUTE) after the 110 is scheduled to leave for the city. Thankfully pretty much every bus arrives 5-10 minutes earlier than scheduled so I don’t miss that connection, but occasionally you have a driver stick to their schedule and you arrive as the 110 pulls away. I asked them on Twitter what the rationale behind making the schedule take longer so that it misses a connection was, but they never answered… I guess it’s not surprising given that it’s impossible to come up with a logical explanation for that when the route never ran late as it was. Your comments on speed sums up why buses are the lowest form of public transport and why getting people out of cars is a big ask while that remains so. Having to share a road, any road, means timetabling a bus has to account for typical heavy traffic. I too have struck the bus that does half or little more than half the posted speed limit off peak, infuriatingly sits turned off at a stop mid trip whilst waiting for the timetable to catch up and makes my car look ever more attractive and convenient. Who wants to spend the precious hours commuting? Even following buses out west it seems, all have way too much time factored into the trips as they dawdle around the streets at an average 30 km/hr. Buses are great to start off a PT service but should not be the basis of PT. If we are to ever get people out of cars, large scale rail, be it light or heavy has to happen. Signalling faults not withstanding! Rail will never be able to go everywhere buses go though. 75% of public transport users are on the bus, mostly because you can run one on almost any main street in the city. Buses may be the ‘lowest’ of the hierarchy, except that’s what makes them the most important. 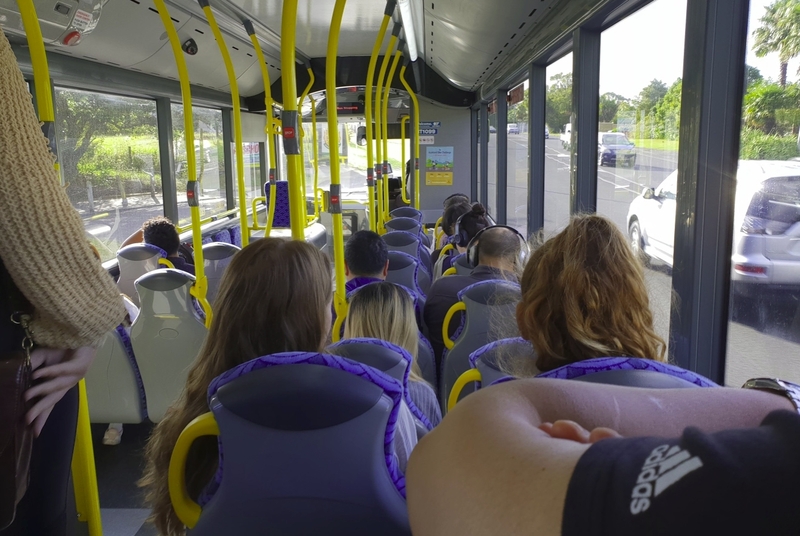 However rail barely services any suburbs therefore its fair to say Auckland has hardly maxxed out on that idea, hence the only other option for the vast majority is the slow bus. But if that is as good as it can get it’s no wonder private vehicles remain so hard to give up on. I can understand why routes eith frequency as poor as the 130 have timing stops. My bigger concern is routes like the 70 as mentioned above. If the bus is timetabled to come every ten minutes it doesn’t matter which minute it comes! Also, the 130 needs to run on the motorway from Hobsonville to constellation stopping at each interchange. Greenhitge deserves its own service connecting down Sunset Road. If a ten minute route doesn’t keep to schedule it won’t run every ten minutes for very long. Timing points are there to keep them ten minutes apart across a range of traffic and passenger conditions. That’s a pretty disingenuous response…. At half hourly frequency, you need the bus to arrive when you said it would. At ten minute frequencies you need the bus to arrive approximately ten minutes after the last one. At thirty minute frequencies, you have to schedule for the worst traffic conditions all year and then slow down faster buses to meet that schedule. That usually means stopping every 10-15 minutes for a few minutes to get back to timetable. At ten minute frequencies, you have to schedule for the worst conditions currently on the road. That means that usually you just run the bus at full speed, sometimes you have to stop the bus for a couple of minutes to not get too far ahead of the bus behind, or catch too far up to the bus in front. In the case of Matt’s 130. If it had ten minute frequencies, in March the bus might take the 67 minutes currently scheduled, in the first week of January it can take 30 minutes. FYI, this is how every bus running every 15 minutes or better is scheduled in London. I estimate that only 1 in every 20 buses I catch actually has to wait to maintain the gap. There is a difference between timetable and schedule. I’m talking about the schedule, which varies run to run and day to day. It doesn’t matter whether you have a 30 minute headway or a 10 minute headway for timing points to matter keeping to schedule. In other words, your bus being late or early doesn’t depend on whether the next bus is scheduled to start its run ten minutes behind or if it is thirty minutes behind. With a 67 minute one way, 134 min return trip, each bus has over two hours to accrue delays before starting the next run. So timing points are required at intermediate locations. Just for the record, I think that many of those here would be surprised at the number of people not on line. My own experience has found the ratio to be about one in five, or 20 percent. I am not talking about cellphone usage here, although I am surprised at the number of people I encounter who don’t have a cellphone . I feel naked if I don’t have mine on me at all times, but my iPhone 7 gets used for just three things, phone calls, texts (mostly work related) and taking photographs – it is now my main camera. What I haven’t seen getting a mention was that afternoon there was a major accident southbound on the south western motorway at Onehunga which saw traffic backed up into the Waterview tunnel. Included in that stand-still traffic were several Airport buses, which could have meant people missing flights. Still, motorway accidents are an almost daily occurrence whereas train signal problems only happen once every six years, no wonder the trains made the news.